In SPIDER-MAN®2, the latest installment in the blockbuster Spider-Man® series, based on the classic Marvel Comics hero, Tobey Maguire returns as the mild-mannered Peter Parker, who is juggling the delicate balance of his dual life as college student and a superhuman crime fighter. Peter's life becomes even more complicated when he confronts a new nemesis, the brilliant Otto Octavius (Alfred Molina) who has been reincarnated as the maniacal and multi-tentacled "Doc Ock." When Doc Ock kidnaps MJ (Kirsten Dunst), Spider-Man must swing back into action as the adventure reaches new heights of unprecedented excitement. Preorder Now & Save 30%! Spend $100, get FREE standard shipping! Happy Birthday Harry! July 31st is Harry Potter's birthday - celebrate with free shipping on orders over $75. Get an early start on school supplies with a Harry Potter Lunch Box and Leather Backpack. Also available are Gryffindor Ties, Chess Sets, Sorting Hats and more! Click here to visit WBShop.com and shop for Harry Potter scarves, toys, games, shirts, watches, posters, artwork and other collectibles. Or shop for merchandise from other Warner Bros. properties like The Matrix, Scooby-Doo, Looney Tunes, Batman, Superman, Wonder Woman, and The Wizard of Oz. HARRY POTTER Publishing Rights © J.K. Rowling, LOONEY TUNES, THE MATRIX, WB SHIELD:  & © Warner Bros. THE POWERPUFF GIRLS:  & © Cartoon Network. BATMAN, SUPERMAN and all related characters:  & © DC Comics. SCOOBY-DOO:  & © Hanna-Barbera. THE WIZARD OF OZ:  & © Turner Entertainment Co.
Visit our Harry Potter Superstore! Spider-Man is actually Peter Parker. Peter is the son of Richard and Mary Parker, both deceased. He was raised by his uncle Ben Parker (deceased) and his wife May. Peter has a keen scientific mind, but spends most of his time as a freelance photographer for the Daily Bugle. He lives in New York City, which serves as Spider-Man's base of operations. He is currently a widower; his wife, Mary Jane Watson-Parker is presumed dead at the time of this writing. His Aunt May is still alive. How did Spider-Man get his powers? While there are some variations on his origin in the comics, the essential origin of Spider-Man remains unchanged. During a high school field trip to a science exposition, Peter is bitten by a spider. In the original telling, this spider had lowered itself by its webbing through a radioactive field. With its last bit of strength, it bites Peter on the hand before it dies. All the proportionate abilities and strengths of the spider are transferred to Peter from the spider's venom. In more modern retellings, the spider has actually been genetically altered, rather than just irradiated. As a result, Spider-Man's powers are more of a genetic mutation than a sheer freak accident. Spider-Man has the proportionate strength and abilities of a spider. This gives him remarkable strength (estimated he can lift up to ten tons), speed, reflexes, the ability to walk on walls ("wall-crawling") and a kind of sixth sense he calls his "Spider-Sense." How does he cling to walls? It's generally accepted as lore that Spidey can adhere to any surface via static electricity. In a storyline that ran in Spectacular Spider-Man #134-136, the villain Electro realizes that Spidey must be using a kind of "static cling" to hold onto walls and ceilings, and he is able to use his electrical powers to disrupt this ability. This would explain Spidey's ability to cling to surfaces using his back and torso and not just his hands and feet. He is also able to crawl on walls even if he is wearing a layer of clothing or gloves, and the application of static electricity would help explain that. How does he see through his mask? Depending on which artist is drawing him, Spidey's "eyes" can be made of either fabric or glass. However, the most common explanation is that his eyeholes are actually a kind of one-way mirror, either glass or some sort of plastic, that reflect with a white sheen. How does his Spider-Sense work? Even Spider-Man himself is unclear as to the exact nature of his Spider-Sense. In close proximity with other combatants, this sense will enable Spidey to stay a step or so ahead, dodging bullets and other projectile weapons with ease. It warns Spidey of hidden dangers, too, like trap doors or camoflaged opponents. Spider-Sense will also warn of more general threats, and can lead Spidey to dark alleys where muggings are taking place, or warn him of some unseen danger from a news story on the radio or TV. While the power itself is hard to pin down, it's manifestation is usually the same: Spidey will feel a "buzzing" or "tingling" at the base of his skull. 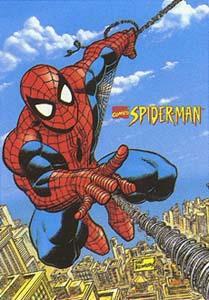 This is represented in the comic books with thick, wavy lines over Spidey's head. How does his Spider-Strength work? Spiders are arachnids, and often display strength that belies their small frames. Spider-Man is much like this. While his body is slender and his build is like that of an Olympic-class gymnast, his strength is actually proportionate to that of a spider, enabling him to move huge and heavy objects, like a 300-pound wrestler or a Buick LeSabre. How do his web-shooters work? Spider-Man's web-shooters are his own creation. Peter designed metal bands that fit around his wrists, each with a spinning nozzle that appears just below his palms. The nozzle is connected to a thin metal strip that leads to a controller that rests in the center of Spider-Man's palm. Inside the web-shooter's wristband is an opening where Spidey snaps a web fluid cartridge into place. By applying pressure to the control on his palm, Spider-Man can shoot webs from the nozzle. Most often, Spidey bends his two middle fingers on each hand into his palm in order to trigger the web-shooters. Careful application of pressure on these triggers enables Spider-Man to change the form and thickness of his webbing, from thin strands for swinging around town to thick, gooey nets to hold the bad guys. The web-shooters also seem to have a kind of "safety" or failsafe that allows Spidey to make a fist without accidentally setting them off. The webbing itself is a remarkable concoction, with the tensile strength of steel and an adhesiveness just short of that of Super Glue. However, it also is designed to simply dissolve into thin air in a matter of an hour or so, so Spidey doesn't leave web lines all over Manhattan. Peter has also created special kinds of web fluid for particular purposes, such as a fire-extinguishing webbing or a sponge-like, water-absorbing webbing. Spider-Man wears a belt of web fluid cartridges under his costume so he never runs out of webbing when he's adventuring. It's been mentioned that Peter Parker could have patented this web formula and made millions of dollars as a result. But, in the comics, he is afraid to do so lest some smart cookie also figure out that he is Spider-Man. create custom baskets of your own. "We Sincerely Hope This Site Was Useful And Beneficial To You"